THE LOW-FODMAP DIET FOR CROHN’S DISEASE Priya Tew Freelance Dietitian and Specialist in Eating Disorders Priya runs Dietitian UK, a freelance dietetic service that specialises in social media and media work, consultancy for food companies, eating disorder support, IBS and chronic fatigue. She works with NHS services, The Priory Hospital Group and private clinics, as well as providing Skype support to clients nationwide. IBD group. A higher adherence was associated with a longer duration of symptom improvement. Foods most often not reintroduced were wheat and onion (fructans) and dairy.3 It was concluded that the low-FODMAP diet seems to decrease functional gut symptoms in IBD. Another study on 88 people looked at symptoms and stool, finding a significant improvement on the lowFODMAP diet in symptoms and stool consistency.4 IS ONE FODMAP OF MORE CONCERN THAN ANOTHER? Copyright © 2019 NH Publishing Ltd - All rights reserved. Available for printing and sharing for the use of CPD activities for personal use. Not for reproduction for publishing purposes without written permission from NH Publishing Ltd.
Banana, rhubarb, kiwifruit, dried cranberries (1 tbsp), pomegranate (½ small or ¼ cup seeds). Crohn’s disease compared to the other two groups. More research is needed to look into the impact of lower intakes of prebiotic fructans on gut microbiota. diet should be used in the short term only. This is exactly how the diet was designed to be used, but many people stay on the restrictive, exclusive phase of the diet. This can be due to fear of their symptoms reappearing, or a lack of support and education from their nutrition team. Encouraging and empowering people to the reintroduction stage is vital for their longterm health. 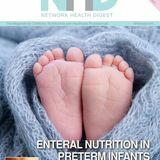 If, for some reason, a patient does need to follow the exclusion stage long term, then supplements are likely to be needed to help the microbiome and to correct nutritional deficiencies. What are FODMAPs and what effects can they have on the human gut? Explain how a low-FODMAP diet can help with symptoms of IBS. What evidence is there to show that active Crohn’s disease sufferers consume lower quantities of fructans? 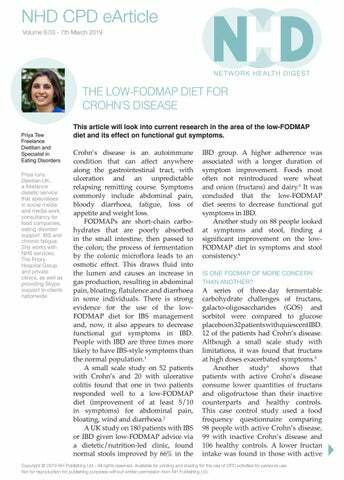 What are the limitations of the low-FODMAP diet in the nutritional management of Crohn’s? Why is the low-FODMAP diet not suitable for use long term? Please type additional notes here . . .